The biggest problem for the Lexus NX series was the limited cargo and cabin space. As a result, it never managed to become too family friendly, meaning bigger families have always turned to other bigger vehicles when in the market for a small SUV. The exterior looks, luxury level, and infotainment, however, made it brilliant for everyone else. 2016 Lexus NX 200t received a few updates but nothing major. In fact, the only update it received is improved smartphone connectivity with Lexus’ Enform. Other than that, it’s exactly the same, but let’s recap on the pros and cons of it, and why you should at least consider it. The compact luxury SUV segment isn’t a segment short of entries. It’s one of the busiest SUV sectors after the crossover perhaps. Standing out and being unique in it then can be a bit challenging, to say the least. It is, however, something the NX is great at. Amongst the bland vehicles on offer, the NX is a breath of fresh air in more than one ways. For starters, there’s the styling which is in your face, to say the least. It’s not conventional by any means but follows Lexus’ current design vision. Compared to the boring looking vehicles in this segment, the NX will draw you in with the looks alone. It’s not a beautiful design, but rather a striking one. It does seem to be a type you either love or hate, but most people do seem to like the uniqueness of it if nothing else. It starts with the massive front which just seems to be as aggressive as possible in an SUV. The big grille takes up nearly the entire front fascia but it contours the lights nicely. The little LED daytime running light underneath the main one looks great, it’s reminiscent to what we see on the new vehicles from Lexus like the IS and here it’s incorporated even better in our opinion. The overall shape allows us to easily conclude that this is one small SUV and the roofline is really sleek although the main look of the vehicle is like a fighter jet. The reason being like that is that you get the massive door and body panels, which along with the small windows make the entire cabin seem to be attached on top like a fighter jet canopy. It has a great presence even as a daily driver and most people will easily notice it. The rear of the car is a bit more conservative but we like that it manages to match the aggressive front. The inside may not be as striking as the exterior but it’s one of the most functional and nicest interiors in the segment. Build quality and fit and finish are Lexus quality which is to say top-level. The materials used feel expensive and are soft to the touch. Everything from the roof to the floor mats is exceptional and can’t be found in any other vehicle in the competition lineup. All of the controls apart from the infotainment ones are easy to reach and understand. The display audio system that comes as standard uses a knob-and-screen system which is similar to that in most German competitors but here it’s a just a bit less intuitive. If you do opt for the Remote Touch you won’t have this issue since all of the menus are controlled with a console-mounted touchpad which is really easy to handle and understand. Although it’s a great system it takes away too much driving concentration so just be wary of that. The only real drawback is the lack of any kind of smartphone integration, both for Android and iOS. There’s decent amount of cabin space for passengers in both rows with more than enough support on all seats although you’ll probably be disappointed by the cargo room or lack of to be more precise. It can only take 54.6 cubic feet of luggage with the seats folded and that doesn’t even include the awkward raked lift gate which makes loading and unloading difficult. Put the back seats up and suddenly that room shrinks to 17.7 cubic feet meaning it’s got less cargo room than even certain small crossovers. 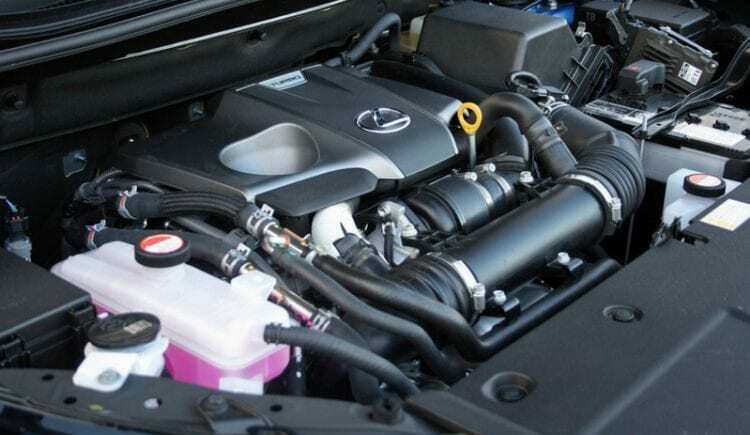 Under the hood of the 2016 Lexus NX 200t, you’ll find a 2.0 liter turbocharged four-cylinder just as the name suggests. It develops 235 hp and 258 lb-ft of torque and is mated to a six-speed auto transmission and as per class standards front-wheel drive is the drive of choice as a basic option. All-wheel drive is available at an additional cost of course. Performance is good but not the best. A front-wheel drive NX 200t managed to get from 0 to 60 miles per hour in a respectable 7 seconds making it exactly average for this segment. If you want more power, you might consider looking for a model from another car maker, but, we need to say that this turbo unit is quite a good choice. Still, one good thing about this smaller engine is fuel economy. IT manages to return 25 miles per gallon on the combined run for the front-wheel drive version while the all-wheel drive system equipped NX 200t will return 24 mpg, 1 shy of its FWD cousin. The 2016 Lexus NX 200t looks the business and it certainly means it too. The suspension is stiff and handles body roll very nicely keeping it to a minimum. Bumps are absorbed more rather than sent through the chassis but it’s not wayward or floaty. Although it is a compact SUV, the steering isn’t as dead or numb as we’ve come to expect from cars in this segment. If you go for the optional F-sport handling package you should prepare yourself to be amazed further. The sporty suspension and the Active Sound Control system which pumps noise into the cabin add even more drama to the NX package. Since it is a luxury compact SUV, of course, they’ve had to resort to artificial noise to get a bit of that fun element back. It’s really quiet when you want it to be, the turbocharged four-cylinder really does pull like a V6 and it’s quiet and refined. Everything you might want from a small luxury SUV. Prices start at around $34,965 for the front-wheel drive version and go up accordingly. If you want AWD system to be added be prepared to give $1,400 more. I personally don’t like the grille on Lexus, but the car is ok.